That’s not how it should be. 1 on 1 meetings should be something you look forward to. Done well, effective 1 on 1 meetings are an opportunity for feedback, coaching, rapport building, and talking about all the things important to you that seem to always slip. They’re a chance for you and your manager to strengthen your working relationship, and get out of the day to day task grind. 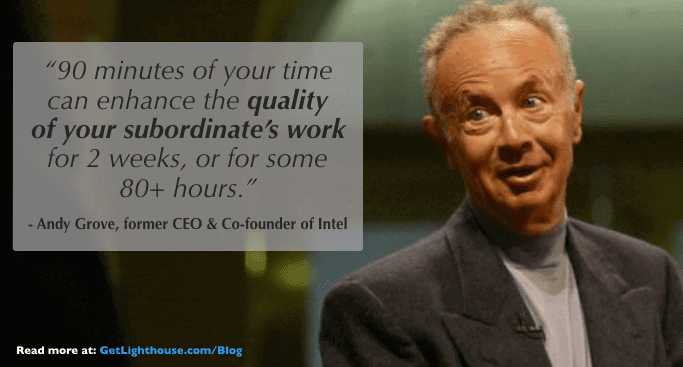 Despite this, 1 on 1 meetings are too often wasted or do not happen. This robs every employee of the opportunity to be at their best at work every day. 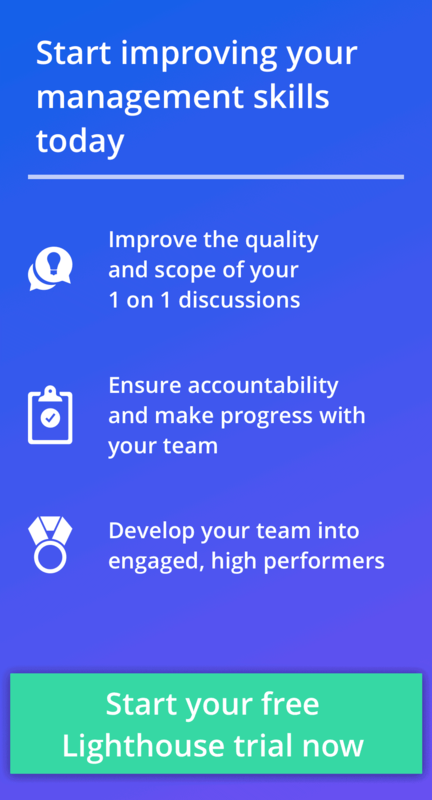 While the final responsibility falls on your manager to make these meetings great, there’s many things you can do to improve yours. Through your efforts, you can help your manager better recognize their value, and fill in areas where they may be slipping as they run from project to project, and fire to fire. Most managers really do care about their people. They’re much more unaware and overwhelmed than evil. If you do have a manager like Dilbert’s that creates a toxic environment, and doesn’t care at all, it’s time to look for another job. For everyone else, today’s post can help you improve the quality of your 1 on 1 meetings with just a few tweaks. 1) Don’t let them cancel. Ask to reschedule. One of the biggest sins preventing managers from having effective 1 on 1 meetings is frequently canceling them. It’s hard to get into a good rhythm if you go weeks (or months) without talking. Even worse, it can cause a backup of issues to discuss that get worse as they go unaddressed. No one likes seeing a problem coming and then have to watch it blow up. However, you probably see problems coming before your manager does. Without a 1 on 1 meeting, you may not get a chance to talk about it before it’s too late. Unfortunately, when 1 on 1 meetings get canceled often, any hope of the meetings being effective goes out the window. Why put effort into a meeting that you don’t expect will happen? It’s hard to say no to your manager when they come to you asking to cancel your 1 on 1 meeting. They probably came to you with a good reason. And they are your manager, after all. It’s hard to say no to them. Reciprocity: You’re agreeing to what they want, and immediately setting them up to then feel obligated to return the favor by rescheduling in exchange for not meeting now. And, not but: By framing your response using “and” instead of “but”, you build on the discussion instead of feeling like you’re disagreeing. Immediacy: By immediately requesting to schedule a different time you ensure they don’t forget about it. To really be a pro with this tactic, be prepared to suggest new times. If they asked in person, bring up your calendar right on your phone. If they asked over email, look at your calendars and try to book a time you see that works. The easier you make it for your manager to say yes, the more likely you are to avoid canceled 1 on 1 meetings. Every other tip we have below for you to have effective 1 on 1 meetings is focused on you regularly having these meetings. It all starts with finding a way to get your manager to stick to them, and this approach can help make sure they happen. When a manager or team member says they don’t see the value of 1 on 1 meetings, it’s a virtual certainty they spend most of the meeting talking about projects and status updates. That’s a huge waste. For your manager, it can be so tempting: they finally have a chance in an otherwise hectic week to talk to you about your work. If you’re on a big team, this may be one of the few times they meet with you alone. If they feel out of the loop, then they’ll want to talk to you about projects to feel like they know what’s going on. It’s also a super safe topic to fill the time, and avoid tough, sometimes uncomfortable, subjects that really matter. Get them their status updates outside your 1 on 1 meetings. Your manager needs a status update, even if you don’t talk about it in your 1 on 1 meeting. The best way then to get them out of your 1 on 1 meeting then is to find ways to get them a status update another time. Email Update: Simply send them an email at a frequency you agree makes sense with some basic updates from you on your work. Stand Up Meeting: Suggest to your manager you and the team start having a standup meeting to provide daily, bite-size updates. This can ease concerns for even the most tense manager. Use a Tool to Help: There are quite a few tools out there from email based ones like IDoneThis to Slack-based ones like StandupJack. They all help organize status updates for your manager across your team. Whichever option works best in your situation, work with them to perfect it. The better the updates they get, the less you’ll both be tempted to talk about status updates in your 1 on 1 meetings. This frees up time for all the great topics that make for effective 1 on 1 meetings. 3) Bring things you want to talk about. It’s not your manager’s fault if you have nothing to talk about in your 1 on 1 meeting. In fact, every time you come to your meeting with nothing to discuss, it makes them dread their 1 on 1 meeting with you a little more. It also gives them another reason to want to cancel, or fill the time with status updates. No one likes pulling teeth, and it can be excruciating to try to draw everything out of you. This is why it’s important for you to think about what you want to talk about. Don’t make your answer to, “what do you want to talk about?” a blank stare. Make an agenda for your 1 on 1 meeting. Team Improvement: Have ideas to help the team improve, or work better? Effective 1 on 1 meetings are a great time to discuss them and either come up with ways to apply them, or understand why you can’t do them. Self Improvement: Want help, feedback, or coaching on something? Ask! By specifically asking, your manager is more likely to be able to carve out time to help and provide feedback in that area. Personal Topics: Is there something personal they should know like a family death or sickness, stress at home, etc? Letting them know about things that affect your work can help them have more empathy for you, and open up the potential for reasonable accommodations. Interpersonal Issues: Having problems with a coworker? Your manager can help mediate, or coach you through how to deal with the issue. Your manager is not a mind reader! If you don’t tell them, don’t expect them to know. Even great managers struggle to understand what their people need when they’re tight lipped. Effective 1 on 1 meetings happen when you do your part to bring things you want to discuss. The best way to ensure that happens is to make sure you write down topics as you think of them, and bring that list as an agenda to your 1 on 1 meeting. 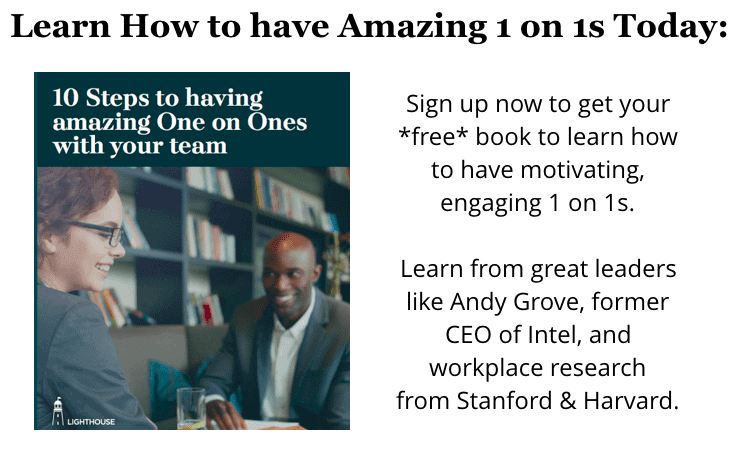 Are you a manager looking for help managing the agendas and other keys to great 1 on 1s with your employees? Then sign up for a free trial of Lighthouse here. 4) Talk about your career goals. We hear a common scenario over and over again: During your performance review, your manager asks you what your career goals are. You have a good conversation about ways you want to grow, and it’s noted in your review. Then, six months to a year goes by, and nothing happens. When you finally get to your next review cycle, you both realize you haven’t talked about your goals since last review. In a rush, your manager copies over what you discussed last time and moves on to the next part of the review. They think they just saved 20 minutes, and you’re left feeling disappointed. Is it any surprise that all the research shows that career growth & development is the top perk employees look for in their next job? It would be great if your manager went up to you and said, “I really care about your career growth, so let’s find a time on our calendars to talk about it soon.” Unfortunately, even the best managers rarely get the chance to say that. However, this is the beauty of your 1 on 1 meeting; it’s a flexible time already on your calendars where you are the main subject of the meeting. This is the perfect time to bring up any skills you want to improve on, new things you want to learn about, or a new role you aspire to. 3 Approaches to having a great career conversation. What to do if you’re not sure what you want to do next. How to grow your skills if a promotion isn’t possible (or what you want). Your manager likely knows about opportunities in the company you do not. If you make your career and skills growth part of your 1 on 1 meetings, they’re much more likely to recognize a role you could fit when internal openings come up. It also creates an opportunity for you to make regular progress between review cycles. By breaking down challenges into steps you can accomplish between 1 on 1 meetings, you tap into the best way to stay motivated at work, according to Harvard research. Career growth and development conversations are an essential part of effective 1 on 1 meetings. Put them on your 1 on 1 meeting agenda so you don’t wait for next review cycle to talk about them. 5) Encourage your manager to take notes. There are few words to dread more in a 1 on 1 meeting than hearing your manager say, “I’m sorry. What did we talk about last time?” Suddenly, any progress you hoped to make to build on is being reset. You now have to spend a big portion of your time refreshing their memory. How could your manager forget something so important to you? It’s often an innocent mistake. They’re running in a million directions and your 1 on 1 meeting is just one of many conversations they’ve had in the last few weeks. It’s hard for them to remember off the top of their head. This is why they need to take notes. Ask your manager to write things down. Whether your manager is afraid they’ll interrupt the flow of your meeting, or they just don’t have a habit of doing so, you need to convince them to take notes. Studies show it will have a major impact on their memory and preparation for your future 1 on 1 meetings. If you also see them look like they want to write something down, but hesitate, encourage them to take a second to do so. 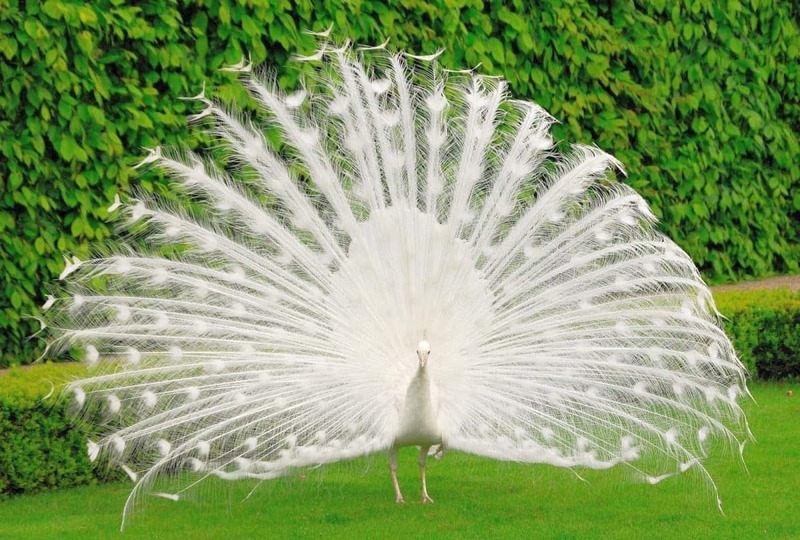 You can use positive reinforcement to also thank and praise them for doing it. The more they take notes on the most important parts of your 1 on 1 meetings, the more valuable they’ll become for both of you. They’ll be more prepared, and you’ll trust you can build on what happened in the last meeting. Finally having a great conversation with your manager about something important to you feels great. Like a pressure relief valve finally letting off a build-up of steam, you feel relieved. Unfortunately, that feeling can be very short-lived if a week or two later you’re talking about the same issue again. Taking notes in the meeting will help with some of this, but even then it’s easy to continue to revisit the same issue without making progress. If you’re meetings always simply end with something like, “See you next time,” don’t be surprised if some of your discussions start to feel like a broken record. Close the meeting by talking about steps for next time. Without action, there is no progress. Without progress, there’s no change. And if nothing changes, you’re going to get discouraged. You will start to see little point in continuing to talk about issues and ideas important to you. What’s more meaningful than progress on what you talk about in effective 1 on 1 meetings? By presenting it as a question, you make your manager feel like part of the solution, which makes them more likely to keep their commitments coming from it. You can, and should, also propose next steps to make it a group action. Establishing next steps is a great way to ensure you continue to have effective 1 on 1 meetings for the long term. Taking 2 minutes at the end of your 1 on 1 to set them can make all the difference. 7) Think about your manager’s view. There are two people that make up a 1 on 1 meeting. So far, we’ve focused on you, and how you can get your manager to do a few more things that benefit you. It’s also important to remember that across the table, video chat, or conference room is another person. They also have stresses, pressures, challenges, ideas, and needs. Depending on what’s going on in your company, they may not be getting the support or attention they need. They may have the best of intentions, but be overwhelmed to the point of it possibly being too much. Ask about how you can help and support them, too. Taking even a few minutes to talk about how you can help them can make a big difference. If your manager has a really big team, they can use all the help they can get. In the loop: Find out what they feel out of the loop on related to your work. Create a light-weight way to keep them updated. Take the lead: If they’re managing many projects at once, offer to take the lead on one part so it’s not on them to lead every meeting, decision, or deliverable. This is also a great way for you to build leadership skills. Learn their style: Simply adapting some of your deliverables to fit a style that makes their life easier can be a lifesaver. This could be a summary page, a certain template they prefer, or timing of when to request feedback. When you show a little empathy and accommodation to your manager, it makes them more likely to want to do the same for you. It also builds trust, which can be invaluable when they’re considering who to promote or give more responsibility. Effective 1 on 1 meetings are a two way street. Take a few minutes to talk about ways you can help them, and you’re more likely to get what you want, too. If your 1 on 1 meetings with your manager do not feel worthwhile, consider these tips great ways to make them better. A few small changes on your part, and some healthy nudges for habits for them, can make all the difference.